Cacti of the Astrophytum myriostigma v. quadricostatum (3,5) species are approx. 3-5 years old and are planted in 3,5 cmpots. 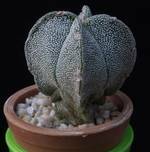 Astrophytum myriostigma v. quadricostatum (3,5) is available for only 1.50 €!